Once upon a time, Batman V Superman: Dawn of Justice and Captain America: Civil War were to open in theaters on the same day, drawing the line in the sand for those who love DC, and those who love Marvel. If EB Games Canada is to be believed, DC and Marvel will be going head to head in a different area: the toys-to-life video game market. Disney has only given a vague March release date for the Disney Infinity 3.0 play set, Marvel Battlegrounds, but a posting on the EB Games Canada website has it listed for a more specific date of March 15th, which just so happens to be the day when the Superman and Aquaman Fun Packs are released for Lego Dimensions. 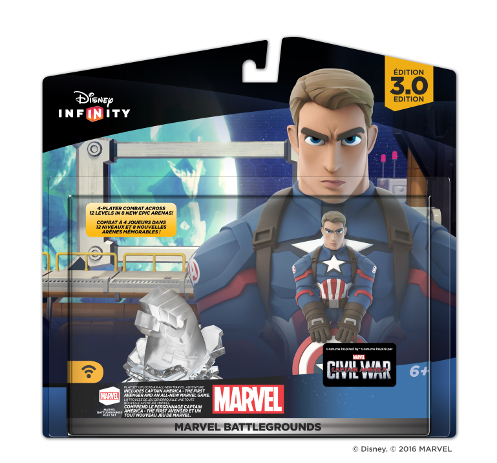 The page for Battlegrounds also only lists one figure in the play set, the already shown maskless Captain America, making it the first Disney Infinity play set to release with only one figure. Disney has not given an official release date for Marvel Battlegrounds, but normally when EB Games puts a place holder on something, it’s listed for December 31st. Take it with a grain of salt until something more official is firmly announced, but it looks like we’re possibly a month out from the first 3.0 Marvel play set.